Cleveland & Buffalo Transit Co., Cleveland, OH. 52 & 80 & 96" cylinders by 144", 5,500hp @ 24rpm, stroke engine by W. & A. Fletcher Works, Hoboken, NJ. 12'6" x 12', 129# scotch boilers. 28.5' wheels with 12' buckets. Hulk broke up in Rouge River; scrapped by Nicholson. 1896 Buffalo & Cleveland route. 1896 Made 306 trips to Buffalo durning Pan American Exposition. 1898, May 21 Collided with tug PETER GORMAN at Buffalo Harbor; the GORMAN sank. 1903 / 04 Lengthed to 340'3" x 43'7" x 17', 2,940 gross tons, 1,604 net tons. 1921 Six new scotch boilers, 13'2" x 10'10". 1923, Jun 23 Damaged by storm & lightning. 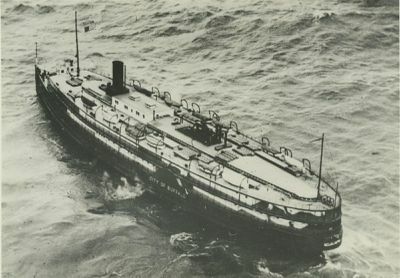 1929, May 2 Adrift after broken steam chest; anchored off Ashtabula, OH, Lake Erie. 1934 - 1937 Occasional trips to Put-In-Bay or Port Stanley. 1937, Mar 19 Gutted by fire at Cleveland, OH. 1937 Owned Wm. Nicholson, Detroit, MI.